He’s often referred to as “the artist that paints Seattle underwater” or “the artist that paints peaceful post-apocalyptic scenes of cities.” Still other people know him as the artist that creates amazing surrealism, so detailed it looks like a photograph. And many had the opportunity to watch him paint at Art Shows in the malls during the 70’s and 80’s – his original paintings were of boats, lighthouses, and Northwest scenes. His artistic career has spanned 44 years, and counting. Although his travels take him all over the world, Washington has been his home for over 25 years. T im works with acrylic paint on canvas, using paint brushes. There are no computers, no projectors, no airbrushes, not even a plumb line – only the paint and brushes. Every painting is done completely freehand, the old fashioned way. He is a natural artist, self-taught, showing his talent at a very young age. His career started in 1969, when he was still in high school, and continues today. Giclee (zhee-clay) is a French term, in this case meaning “spray of ink”. A giclee is a Fine Art Reproduction on Canvas, from the artist’s original painting. Most of us cannot afford to buy an original painting, so giclees are the next best thing. They have the look, feel, and longevity of an original painting for a fraction of the cost. 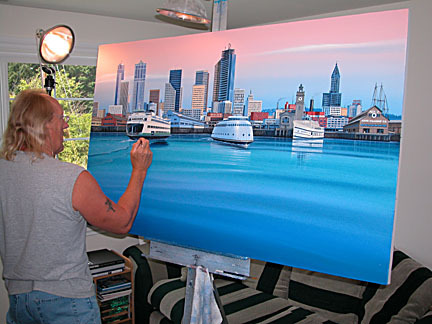 Each is personally signed, numbered, and enhanced by Tim, creating a unique and individual image. Come discover Tim’s collection for yourself, now featured at the Courtyard Gallery~ Please stop by the shop, give us a call, or send requests via our Contact Form.